For the last four years, this has arguably been the global church's most important pending appointment... and over that time, the stakes have only increased. After the long wait – and a geopolitical shift that revolutionized the context – it's finally come to pass: at Roman Noon this Tuesday, the Pope named Juan García Rodríguez, the 68 year-old archbishop of Camagüey in central Cuba, as archbishop of Havana and de facto chief of the island's church, retiring Cardinal Jaime Ortega y Alamino after a landmark reign of almost 35 years. In an unusual shot for its time, the archbishop-elect – then the president of the Cuban bishops – is seen above at the right hand of President Raul Castro during the 2010 dedication of the new national seminary outside Havana, which marked the island's first opening of a religious building since the 1959 Revolution that swept Communism into power. And with today's nod, García – a native son of the diocese he's led until today – now fully trades the intimate, earthy confines of "cow country" for the religious and political gauntlet of the capital in an ongoing moment of massive transition, one whose outcome is far from settled. On one side, the incoming archbishop becomes the church's principal voice in Cuba and its lead representative to the Communist government, a role which saw Ortega secure major incremental concessions for the church's freedom from the officially atheist state, but likewise made him a magnet for scorn among the influential exile community, which accused the cardinal of turning a blind eye to the regime's human-rights violations in exchange for the increased openings for Catholic life and activity in the open. As if navigating that tightrope wasn't enough, the 2.8 million-member Havana church is said to be in need of better cohesion in light of both the diversity of its presbyterate and a sense of listlessness at the helm given Ortega's priority on working the political stage both at home and abroad, a legacy whose capstone came in the cardinal's role as a linchpin intermediary in securing the watershed 2014 agreement between Cuba and the US which marked the most significant breakthrough between the estranged countries since the 1959 Revolution. Already a figure close to the now-Pope – whose game-changing "mission statement" given during the pre-Conclave General Congregations of the cardinals was released by Ortega days after Francis' election – the Cuban's victory lap saw another triumphant moment on Palm Sunday when, minutes after President Obama became the first US head of state to visit the island since the 1920s, the cardinal was the First Family's tour-guide as they visited Havana Cathedral (right). While Ortega's critics have seen fit to deride him for his realpolitik strategy and the "prince"-like style he took up as the capital's archbishop, one meaningful backstory nonetheless bears recalling: like many other young Cuban priests and religious who chose not to flee the island during what's been called "the worst repression" of the faith in the Revolution's wake, the future cardinal was imprisoned in a government "re-education camp" with the intent to break the remnant's commitment to the church and their ministry. As a ranking op mused about the experience, "the generation that stayed went to hell and back [to] keep the faith alive" in their homeland. Amid the multi-tiered scene, following the Pope's mobilization of his diplomatic A-team to facilitate the pact – which brought the restoration of full bilateral relations and a major easing of half-century old financial and travel restrictions for Americans – the choice of Ortega's successor only became a more charged matter for Francis and his team, especially as one of its key players (the Sostituto of the Secretariat of State, Archbishop Angelo Becciu) was himself Nuncio to Havana from 2009-11. Against the challenging backdrop, meanwhile, the most striking thing about Francis' appointee is García's concerted lack of political involvement. 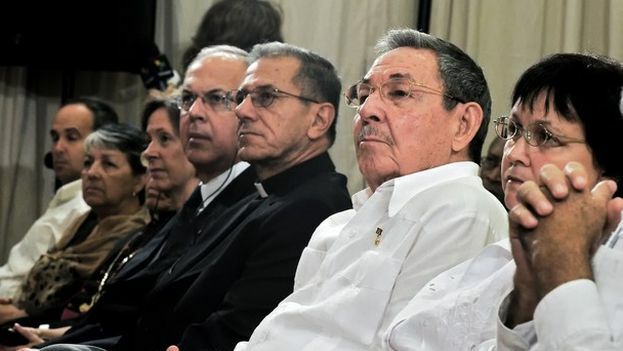 Said by those who know him to be "very humble," "low-key" and "bearing the smell" of his flock, a 2013 primer on the Cuban bishops with an eye to Ortega's succession noted that – at least, at the time – the now-chosen prelate hadn't figured much in conversations for Havana, but pointedly perceived the eventual choice as "very much a bishop in the style of Pope Francis: known for his missionary spirit and as a man of prayer with the ability to remain calm in the midst of any storm." 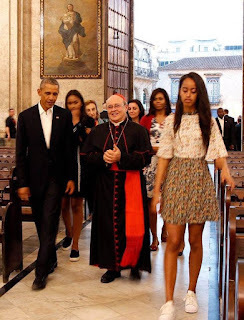 Along these lines, Whispers' Havana Desk relayed that García's name began credibly circulating for the post shortly after Ortega's 50th anniversary as a priest in summer 2014, an event which was notably attended (left) by the Pope's principal North American adviser, Cardinal Seán O'Malley OFM Cap. of Boston, himself a figure with a long history of involvement in Cuban affairs. From the flip-side, meanwhile, with members of his own family living in the exiles' prime base of South Florida – where he was recently spotted on visits – García is no stranger to his opposite end of the 93 Mile strait, either. 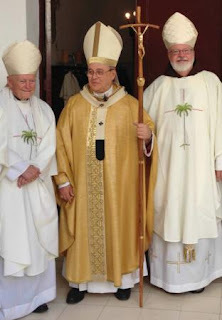 On another significant front, having been president of the island's dozen-member bench from 2007-10, García led the Cuban delegation to the decennial plenary of the Latin American bishops at Aparecida in 2007, whose closing message – rooted in a call for the church to engage an ongoing "continental mission" – was drafted by then-Cardinal Bergoglio of Buenos Aires in a document that remains a very clear and specific manifesto of Francis' vision of the church. In his own diocese, meanwhile, the Havana pick is said to have an exemplary, unpretentious closeness with his priests in Camaguey, where he pastored several parishes before his appointment as the lone auxiliary in 1997. He was named to succeed his mentor, Archbishop Adolfo Rodríguez Herrera, five years later. Asked about the role of bishops in the new evangelization as the lone Cuban present at the 2012 Synod on the topic, García defined his task as "going into the homes of the people. "When I go out [to the people]," he said, "the priests follow, the deacons follow... the nuns follow, the laity follow, and often, they even get ahead of me." "A mother doesn't rest," García replied when asked about the church's optimal style of outreach. "She wants to feed, she wants to teach. She always hopes her child says 'yes,' that he might learn, and she has patience and creativity" to accomplish that end. Boiled down, it doesn't get more Francis than that. And while time will tell for certain whether the Pope's choice of a pastor from his ever-cherished "peripheries" was geared more toward achieving the church's internal conversion – or, indeed, to maintain Ortega's wide berth as the church's Negotiator-in-Chief with the Castros – odds are it's a bit of both. In any case, it's already been said that the choice of his successor has come as a "surprise" even to Ortega, himself. The first indication of the new state of things is likely to come once the government broaches its rumored intent to "regularize" the fraught status of the island's church – a process which will involve high-wire talks over the return of parish and institutional property seized by the Communists after the fall of Batista – to say nothing of the ostensible, long-frame road toward a concordat: the treaty between the Holy See and Cuba which would establish the rights and conduct of the island's Catholic life in international law. On the broad scene, with the retirement of the Cuban titan months before his 80th birthday, one last long-reigning cardinal holds the helm of his diocese as his ninth decade quickly approaches: Karl Lehmann of Mainz, long the godfather of German Catholicism's progressive wing, who ages out of his Conclave vote on 16 May. The most prominent figure by far to express an openness to the resignation of John Paul II as the now-canonized Pope struggled through his final months – a move for which Lehmann was excoriated by conservatives (among other things which wouldn't happen today) – the cardinal chaired the German bench for an extraordinary 21 years as the conference's elected head from 1987 to 2008. Since 2014, the post has been held by Cardinal Reinhard Marx of Munich – a member of Francis' all-important "Gang of 9," whose ascent has seen him become no less a lightning rod.